Alex Kahl is a graduate student in Oceanography at Rutgers University. But this California native wasn’t always going to be a science major. In fact he originally entered college as an Art history major, but his love of surfing and the ocean soon changed his mind. This is his story. 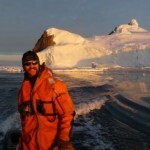 To learn more about Alex, you can visit his web site, or check out his Antarctic Summer blog.